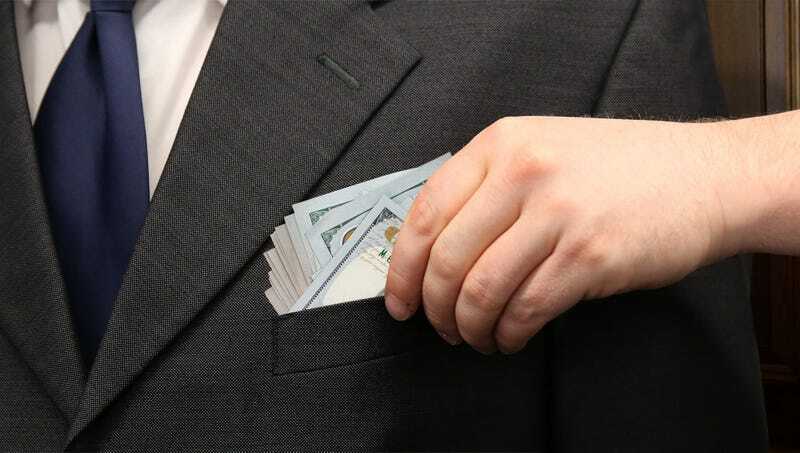 WASHINGTON—In an effort to motivate Americans into giving more generously, a new GOP plan unveiled Tuesday would offer generous tax breaks on all contributions tucked into congressmen’s suit breast pockets. “Under this new proposal, Americans would be afforded the ability to write off any donation that is coolly slipped into the breast pocket of a congressman’s suit,” said Senate majority leader Mitch McConnell (R-KY), explaining that if the plan passed, taxpayers would receive even greater deductions for larger wads slid into elected representative’s front pocket with a wink and a nod. “This should hopefully provide much-needed incentive to Americans to palm off larger denominations while shaking their senators’ or representatives’ hands.” McConnell went on to say that supplemental tax credits would also be provided on each luxury car belonging to the keys that just happen to appear on a congressman’s desk.